Think 'Juicing' is Hard? Think Again! The fad today is to drink your food. I mean can you actually drink some fruit and vegetables and be full? Maybe. Is it fun to sit there and throw everything from your kitchen (excluding the kitchen sink) in a blender and have a mess to clean after only getting about 1 cup of juice out of the $80 of food you just bought? No. The solution to your “juicing” problem is to purchase a Nutribullet. 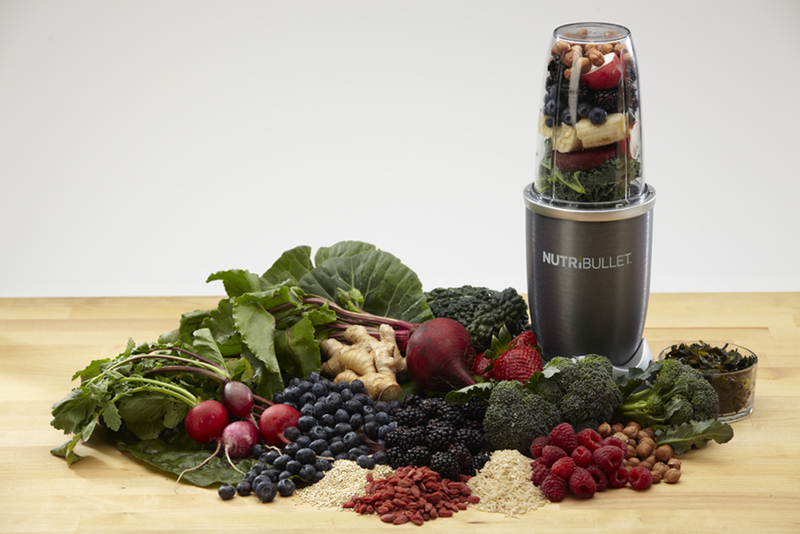 The rumored “magical Nutribullet” that blends anything in seconds is actually a reality. I received mine from my bridal shower and it was the only thing I opened right away back in June 2013. I started mixing the basics; bananas, strawberries, and blueberries with almond milk. Fast forward 9 months and I have a blended concoction that seems disgusting and impossible. Wrong. My average mid afternoon snack entails the following; blueberries, almond milk, cinnamon, dry oatmeal, chia seeds, apple cidar vinegar, turmeric, spinach (or kale), and sometimes, if I’m really feeling risky, I add some vanilla or strawberry protein powder. This, I admit does sound insane. I mean really, what the H E double hockey sticks is turmeric? (Turmeric is a root that is considered a super spice which aids in anti inflammatory and cancer prevention- just to name a few.) The hardest part is to balance out the measurements of all the ingredients and make it not taste like something a contestant on Fear Factor would drink. The Apple Cider Vinegar and turmeric are the biggest challenges, but like anything, a little trial and error and you can easily make yourself a cornucopia of the perfect amount of fruit and vegetable servings your body requires a day and then some. As mentioned before, I drink this magical drink mid afternoon as a “pick me up” (add too much ACV and believe me you’re awake). After a week or so of drinking it I saw my energy level raised and my overall mood improved. Plus its HEALTHY! People always ask what is in my drink with a disgusted look, but honestly you have to put in what YOU like, not what you think should go in it. I went through a banana phase and always had a banana in my drink, but now not so much. I added fresh pomegranates as well but they were too chunky, sometimes I can’t even drink it because what I blended was just not good. Learn and move on. I do not drink this as a meal, although I suppose after a few weeks I could get used to it as one. I like to think of my drink as my “coffee” as I do not drink coffee normally. Don’t be afraid to try out the Nutribullet. It’s so easy a monkey could be trained to use one. You literally just fill up your Nutribullet with whatever food you want, screw on the blade, mix, remove blade, screw on the top and go. Happy Juicing & Good Luck.